"Bud, not Buddy" is a book for readers of all ages. this book illustrates the journey of a young boy desperately in search of his biological father whom he has never known.Due to several crisis and unpredictable circumstances , Bud has decided to flee from is current foster home. 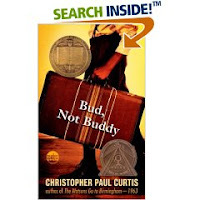 This fictional story by CPC has a true to life touch.Christopher developed several of the characters from "Bud,not Buddy" to represent actual members of his family. CPC displayed the creativity to incorporate fiction with real life characters, who were instrumental within this particular text. These characters guide and mentor Bud through crucial obstacles which prove to be pivotal in achieving his desired outcome. As Bud embarks on a journey of hope, he is confronted with the unpleasant reality of the 1930's Great Depression. This st ory represents a little boy,who is desperately in search of the emotional support he believes a family provides. A little boy who refuses to assimilate to a marginalized life within orphanages,group homes and foster families that are the cornerstones to his abuse, loneliness and unhappiness. Bud's predetermined desire to find his father instills within him the strength to accept rejection as well as the devotion to forge forward to achieve emotional satisfaction. It's 1936, in Flint, Michigan. Ten-year-old Bud may be a homeless boy on the run, but he is determined to find his long lost father, no matter where it might lead him. His mother never told him who his father was, but she left a clue: posters of Herman E. Calloway and his famous band, the Dusky Devastators of the Depression! Bud's got an idea that those posters along with a few mysteriously labeled rocks will lead to his father. Once he decides to hit the road and find this mystery man, nothing can stop him.There are, of course, many set-backs on the way and many people who lend a hand. At the mission where Bud is too late for the evening meal, another homeless family pretends that he's with them. A very kind man who turns out to be a labor union organizer finds Bud hiding at the side of the road near a racial intolerant village and takes Bud home to his own family before transporting him to Grand Rapids to his supposed father. Bud's irrepressible good nature, his innocence and his survival skills make him memorable. His literal interpretation of language, his belief system which includes vampires, tokens and ritual behavior all serve to allow us to see the world through the eyes of a ten year old. The setting in the 30s, the height of the Great Depression, and the small tastes of racism that Christopher weaves in so skillfully make this book stand head and shoulders above the rest. This book is a direct representation of the main reason CPC became an author. He states " While growing up, I loved to read ,but could not find any books about me ." I believe CPC makes a strong connection to his own cultural background, but also connects with children of different social economical level and ethnic make up with this piece of literature. This is supported by the fact that he received a Coretta Scott King Award and John Newbery Medal for his work on "Bud, not Buddy."